Capgemini Tech challenge 2016 - Season 3 is a competition for computer savvy’s with gaming genes in them. The Capgemini Tech challenge is an online competition where a person can compete virtually with the person of any age group. The participant can be a fresher, campus student or can be working elsewhere. Passion for technology is the key to winning this competition. The participant can compete in several competitions if they want to, the following is the list of topics. However, the candidates must note that each sub-contest has a separate set of rules to play. The candidate should have an active social media profile in order to participate. Using fake profiles in order to increase winning chances is prohibited. The winners will be awarded Badges, Certificates and Direct L2 Interview (Not applicable for Tech Aptitude, Linux Admin, Network Security, Oracle DBA). Winners of Theme contest are not eligible for direct L2 interview. The finalists of each contest will form teams and will compete for Digital Challenge (at one of the Capgemini campus) to win Team prize of Rs 200,000. The application process to this contest is completely ONLINE. To apply for the contest, candidates have to follow the given link. The candidates can either register by Signing up using their email id or through their Facebook, Google or Linkedin Account. A participant, after registering, can invite friends. The referral page allows the participant to invite friends through third party email service providers such as Gmail. At each invite, the participant earns 5 bonus points. If the invite gets accepted by the participant’s friend, the participant earns 1000 point more and if the person views the participant’s invite, the participant will earn 5 more bonus points. A participant can invite 500 friends a day and 500 throughout the contest. There will be separate leader board which will provide the ranking of the Top Referrers, on a daily basis. 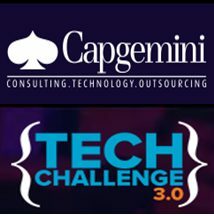 Tech challenge 3.0 enables students or fresher to get a job/ internship offer from Capgemini as it makes it easier for top 2 finalists of the competition to appear for Level 2 interview. The interview doesn’t ensure confirming of job/ internship into the company. It will solely depend on candidate’s performance. Contest organisers reserve the right to decide the prize winners for the referral contest. The challenge contains two round each for every contest. No rounds will have negative marking for wrong answers. Coding can be done in any available programming language out of 38. Codes can get copied from Local editor to online editor. This round will contain 25 MCQ question, for every right answer user scores 4 points each. Time allotted to finish this round is 30 minutes. Each user gets the maximum of 2 attempts to answer correctly, which implies the highest score from both attempts will be considered. The user, to proceed on to next round will have to score a minimum of 40%. First level consists of 25 questions and the time provided is 30 minutes. Each correct answer will get 4 points each. Participant must score 40% in order to unlock the next level. For MCQ level 2, the process remains the same as level 1. Time provided is 24 hour. The participant will have to submit the code during those 24 hours. The participant will get 2 attempts out of which the one with the highest score will get submit. Total score will be a combine of the first and second level. Top 5 scorers on the Leader’s board get to participate in the finale. Each correct answer will fetch the participant 10 points each. Note: The third round will be conducted at one of Capgemini campus during finale. Time provided for this completion is 150 minutes. Each correct answer will fetch 10 points each. Total score will be a combine of first and second round. Top 5 scorers on the Leader’s board get to participate in the finale. There will be 3 different levels in this contest. First 2 levels will be available on the same day to compete in, 3rd round will be launched on the day of finale. First level will consist of 25 MCQ. On every correct answer, the participant can fetch 4 points each. Time allotted will be 30 minutes. A user will require a score of minimum 40 percent to unlock the next level. Each user gets maximum of 2 attempts to answer correctly, which implies the highest score from both attempts will be considered. Similar goes for the 2nd round. ID proof required by everyone, even from Capgemini employees (a scanned copy of your PAN card or Aadhar card or Driving License or a valid Passport).